Castlecary Park is clearly visible from the A75. If approaching from the east, exit at the first Creetown junction and the entrance to the ground is immediately on the right. From the west, take the second exit for Creetown. Entrance to the ground is on the right. Castlecary Park is basically part of a farmers field, although a new log-cabin-style club building was constructed in 2013. It is the only feature of note at the ground. Originally a side called Barholm Rovers played in Creetown, and upon their disbanding in 1905, Creetown Rifle Volunteers took over their Barholm Park ground. 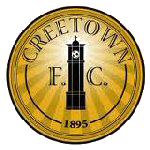 They became Creetown FC in 1920.